So yall may know that I am a sucker for holiday themed mysteries, especially Christmas (lets be honest..Halloween is really the only other holiday themed mysteries I read). So I scoured Audible for a fun Christmas mystery and stumbled on Murder for Christmas. I couldn’t say no to a snowy British Christmas, a historic home, and a dead Father Christmas. 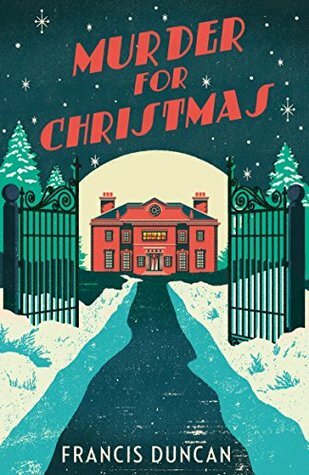 Murder for Christmas turned out to be the perfect holiday read! I absolutely loved the setting! Mordecai Tremaine, amateur sleuth, is invited to a traditional Christmas at the country home of an acquaintance. The story takes place in a large historic home surrounded by snow and all the traditional holiday trimmings. It was fun wandering the halls investigating the inhabitants with Tremaine. Duncan does a fantastic job providing with a variety of unique and quirky characters that kept the story engaging. Most were steeped in layers that were slowly peeled off throughout the story. I found myself actively trying to figure out whodunnit and i as happy to be (mostly) surprised by the big reveal at the end. Also, the voice actor was fantastic! I definitely recommend the audio version of Murder for Christmas. And, I liked Mordecai Tremaine. I loved that he secretly indulged in romance stories and that he couldn’t help but investigate those sharing the holiday with him. I especially enjoyed how kind he was. He was a gentleman to a fault and a romantic dreamer. The writing can be a bit pushy and a tad antiquated at times, but I have a feeling I will continue the series just because of Mordecai Tremaine. I will note that Mystery lovers may find Tremaine to be very blunt and a tad heavy handed in his investigation. He was very forward with his questioning resulting in the people being questioned closing up on him on numerous occasions. I was initially irked at this style but eventually decided it was just part of his charm. Murder for Christmas is the perfect story for those needing a little mystery during this holiday season. Let me know what mysteries you’re reading this weekend! SOOOO happy to find another Cozy Mystery blogger! This Christmas Themed Cozy sounds fantastic! yay for cozy mysteries! I am a sucker for the historical fiction cozies. I’m excited to check out your site! I have a weakness for baking Cozies! Seriously. All of the cooking Cozies!!! !